This is the 1965 Mercury Comet Caliente two-door hardtop. 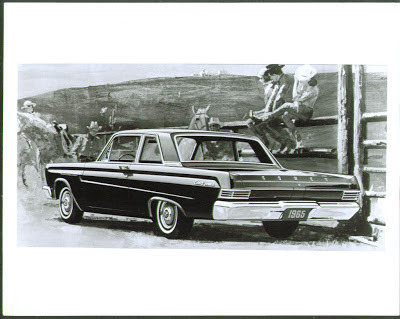 The Comet was originally intended to be a pint-sized companion for the Edsel but the mid-priced make fizzled. 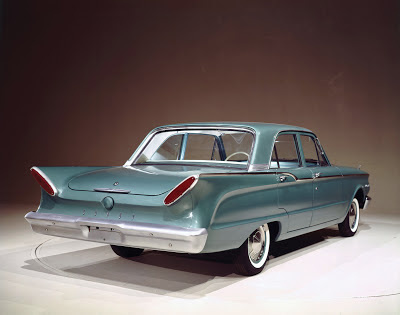 The plug was pulled on November 19, 1959 and Edsel was declared dead. 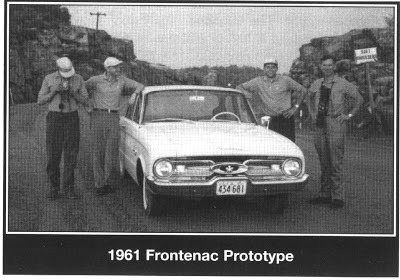 Ford of Canada offered the Frontenac in 1960 but the brand was a one-year wonder. The 1961 model was stillborn to make room for Comet in the Mercury family. Originally conceived as a member of the Edsel lineup, the compact carried very strong Edsel cues. 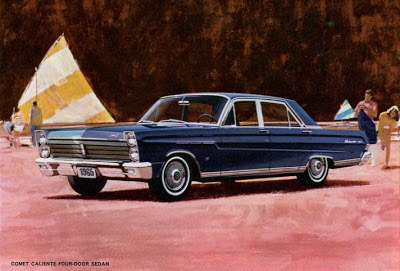 The compact burst over this country for the 1961 selling season wearing the Mercury label. Comet bowed on March 17, 1960 and did well in its first season. 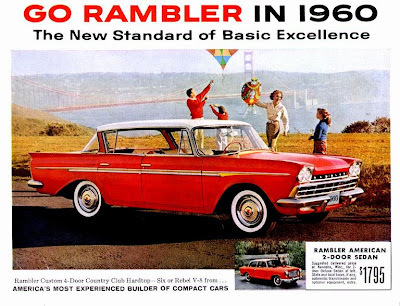 Rambler was a sales and style leader in 1960. Small car madness was all the rage in 1960. 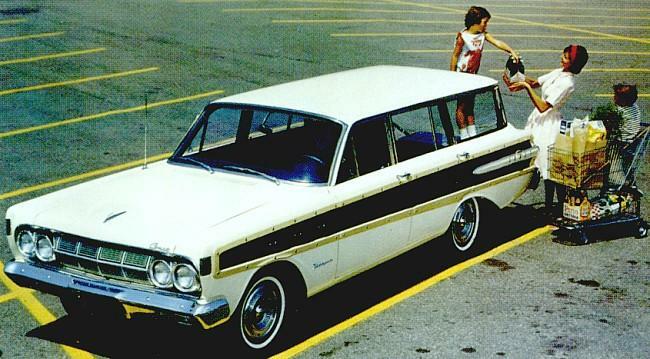 Four of the Top Ten selling vehicles in the US (exclusive of wagons) were less than full size: Ford Falcon Deluxe staked out 4.1 percent of the market for itself with 244,300 sales giving it sixth place. 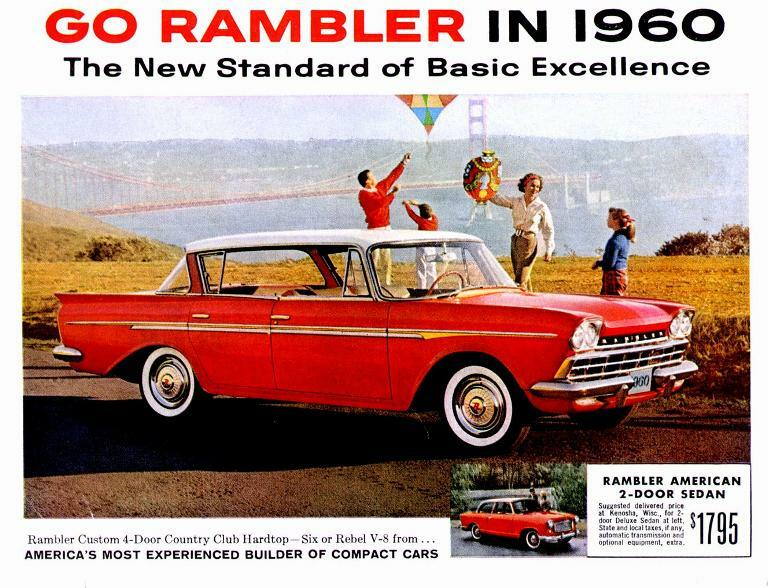 The Number Seven spot belonged to Ford Fairlane with 242,900 sales and 4.1 percent of the market, Rambler rocketed into eighth place with 1776,100 sales or 2.9 percent of the market and Chevrolet’s Corvair 700 series claimed spot Number Nine with 175,800 sales or 2.9 percent of the market. The little Comet skyrocketed. It immediately became the division’s darling, capturing 54.6 percent of all Mercury sales for calendar year 1961. The total racked up to 188,644 units delivered. 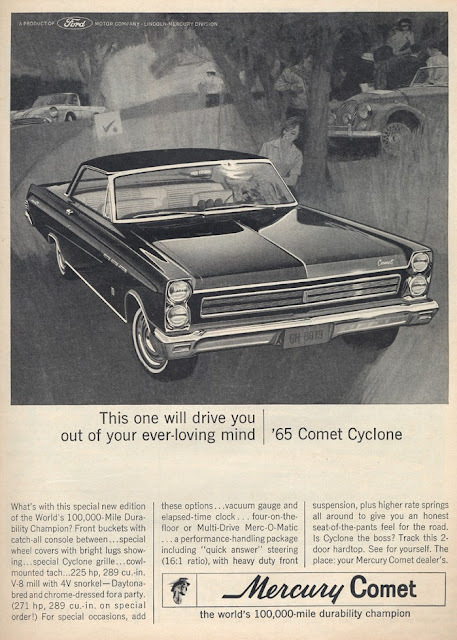 New from the beltline down, a virtually all-new Comet appeared for 1964. 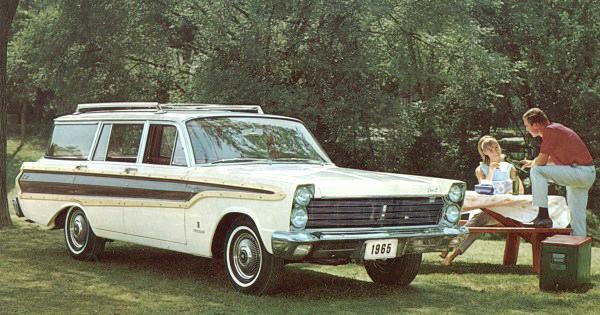 This incarnation was wider than before and carried more big Mercury and Lincoln-like design cues. Body sides were highly sculptured. Comet’s grille was made up of finely ribbed horizontal bars that flanked vertically stacked pairs of headlights. Advertising promised that this beauty now featured “a new young look of luxury.” No matter how you sliced it, this mama sizzled. 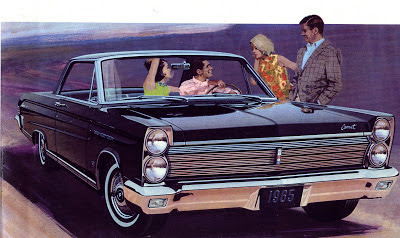 The restyled 1964 Mercury Comet wore a Lincoln-inspired grill. 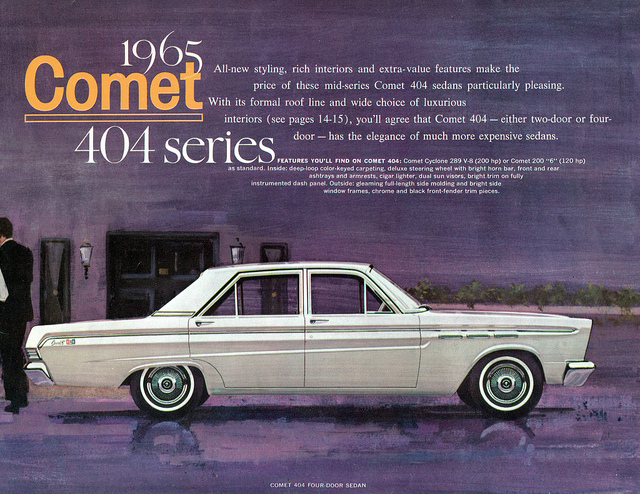 To broaden its appeal, Comet was offered in a wider range of dress: a posh Caliente (Spanish for “hot”), the mid-range 404 series and the economical 202 series. There were wagons in the 404 and 202 series as well as a Comet Villager wagon that was so ritzy it was a natural in front of 24 Sussex Drive. The Comet Cyclone was a mean pocket rocket born to scorch the earth. 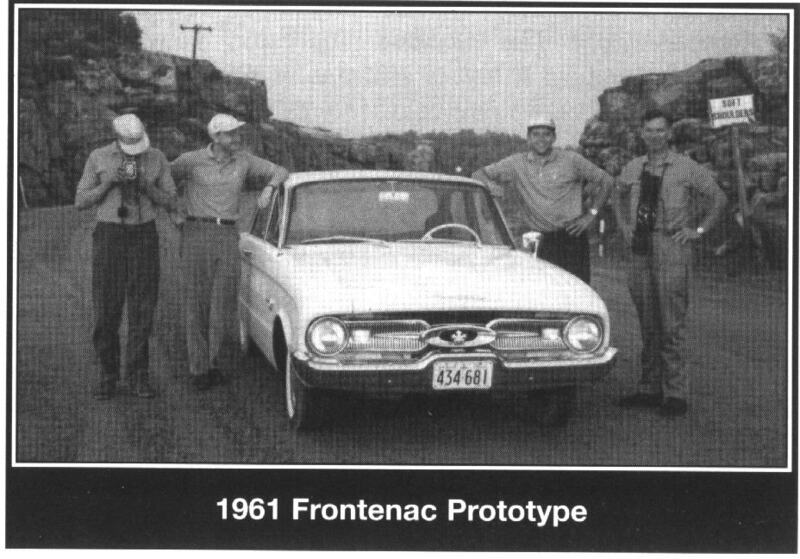 Stacked quad headlights migrated from the grill to the fenders in 1965. 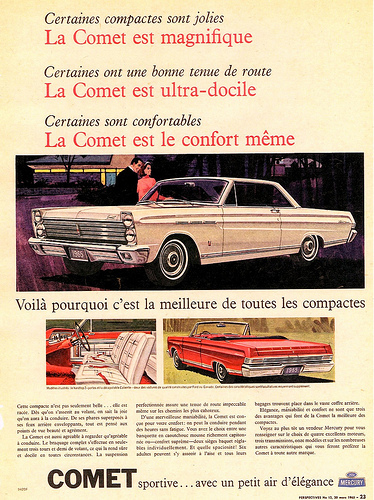 The success of the redesigned Comet would be carried into the 1965 season, too. Caliente promised to be a “not too big a car at not too big a price.” It also swore to forever change the minds of prospective owners who were of the opinion that economy meant dull, and set out to prove it with its optional 3.2-litre (200-cubic inch) six and three-speed, fully synchronized manual transmission. With upholstery in Glove Soft Vinyl and Solar Fabric sewn into a padded biscuit design, walnut-toned insets in the instrument panel and doors, thick loop-yarn carpeting, door mounted courtesy lights and special exterior trim, Caliente was one classy ride. Comet's Villager wagon wore mahogany-look side panels and boasted a power-operated rear window as standard equipment. 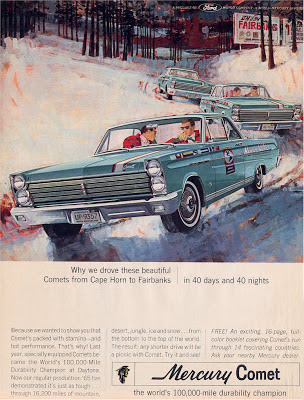 Advertising bragged that Mercury Comets in the 404 series had "the elegance of much more expensive sedans. The 404 series cost less but still offered interiors of Chevron and Cameron Cloth sewn in a “simulated bucket seat style.” The fabric was treated with a soil-resistant conditioner. The 404 also sported color-keyed carpeting, a bright horn ring, bright trim on the instrument panel, a chrome spear on the flanks, a glove box lock and a trio of chrome-and-black hash mark trim pieces on the front fenders. The 404 wagon’s interior was upholstered in vinyl or a combination of vinyl and Tivoli cloth with colour-keyed carpeting thrown in for good measure. Even in the most modest 202 dress, one could order a two-door hardtop Comet. The base 202 series was a no-nonsense stripper. It offered good value with its vinyl-coated, textured rubber floor cover and pleated Corduroy Vinyl and Woven Pleat fabric upholstery. Even the lowliest of Comets carried the distinguished chrome-and-black hash marks on the front fender. Finally there was the Comet Cyclone, a performance oriented two-door hardtop dressed up with its own black out, stand-up grille, bucket seats with sew-through pleats and a centre console. More goodies included chrome-plate wheel covers with lug nuts, an engine “Dress Up Kit” with lots of chrome under the hood, unique insignias, a vinyl roof in black or white and a Power-Pac gauge cluster for the heavily padded instrument panel that included a tachometer and elapsed time clock. Ready to take on every Pontiac Tempest ever built, Cyclone itched to tear up the asphalt with its 4-barrel, Cyclone Super 4.7-litre (289-cubic inch V-8) mill and the extra cost four-on-the floor manual shifter. The Comet Power Teams consisted of the 2.7-lire (170-cubic inch) or the 3.2-litre (200-cubic inch) six bangers, the two-barrel 4.7-litre (289-cubic inch) V-8 with 200 horsepower and the Super 289 version with 225 horses. The latter required premium fuel. Merc-O-Matic or three-speed manual transmissions were available right across the line but only the V-8s could be mated to the four-speed shifter. 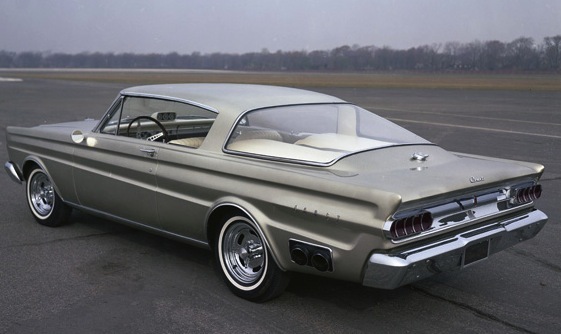 The Mercury Comet Super Cyclone was a concept car that hit the auto show circuit in 1964 and 1965. Exterior Comet colours were Raven Black, Wimbledon White, Rangoon Red, Silver blue Metallic, Arcadian Blue, Caspian Blue Metallic, Silver Smoke Grey Metallic, Twilight Turquoise Metallic, Vintage burgundy Metallic, Sunlight Yellow, Dynasty Green Metallic, Ivy Gold Metallic, Champagne Beige Metallic, Prairie Bronze Metallic and Ivy Green Metallic. Oh, there were 18 extra cost two-tone combinations to choose among, too. 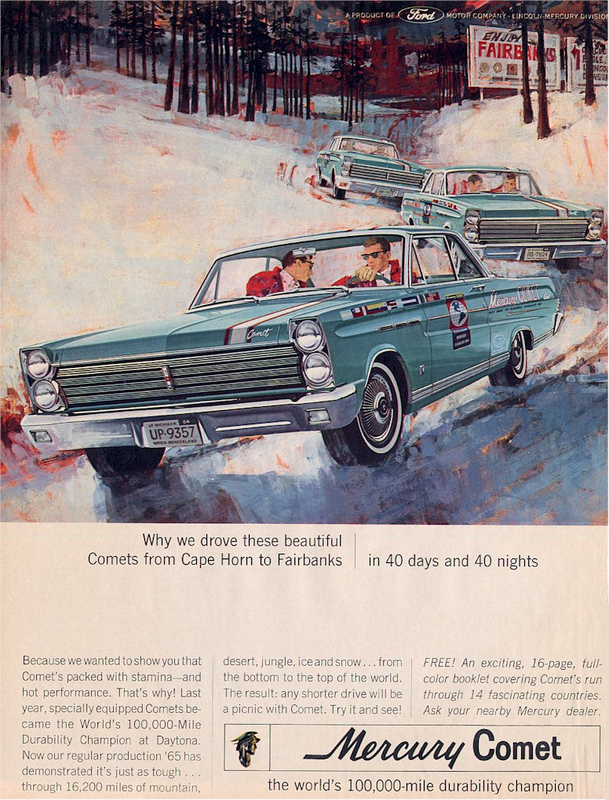 Mercury Comets were driven 26 0858 kilometres (16,200 miles) from the tip of South America to Fairbanks, Alaska in an endurance run. Mercury’s little guy had a sweet options list that included such choice goodies as intermittent wipers, seat belts and seat belt retractors, back up lights, tinted glass for the windshield, power steering, power brakes (when ordered with the Merc-O-Matic transmission), push-button radio, padded instrument panel and padded sun visors and a luggage rack for the wagons.